Great testimonials tell people that your product or service is awesome and existing users or customers are getting great benefits from it. While talking with entrepreneurs and growth hackers the question I came across most is, how to get awesome genuine testimonials from customers? In the very beginning in case of mobile apps, it starts with friends providing reviews and then users also come along and changes in the rating start and it starts to impact your download counts. So how to get good reviews and how to get more reviews to determine your product path is we are going to discuss today at RedElegant. Customers mostly believe other customers. So it is important that you get reviews from your customers and yes the more the positive it is best. 90% of participants of a Zendesk survey claimed that positive online reviews influenced their buying decision, and 86% was influenced by negative reviews. When an infinite number of reviewers share their opinions online, word-of-mouth miracle takes place which increases the potential business exposure and increases traffic as well as sales. So reviews especially positive reviews are so important for the businesses. This is one of the most sought after question from businesses, especially startups. The best way to get reviews is to ask, and the best time to ask is after the customer is satisfied. Unfortunately, I saw many apps seem to prompt for a review almost immediately upon being opened when there’s basically 100% chance that I have something in my mind that I want to do in the app and off course reviewing the app is not one of them (as I don’t know how the app is, yet). If you noticed some good gaming apps you will understand. Right after you scored 5* in a match or after winning a war they ask you to review the app, and as the user is happy, then the most probability is that they will provide the review and also might be a good one. Most apps use intelligent pop ups after app users take some action. The popup reveals itself after the app user does some action for nth time, like — reading 30 news article or after creating 25 posts or simply open the app for say 50 times after signing up first. E-commerce platforms ask for review once the delivery takes place and customer get to see and try out the item just purchased. Even if your product has a problem most users understand that and what matters is fast and good customer service. As fast you will respond to the customer emails or reviews you will be appreciated. Resolving the customer problem fast will result in more satisfaction. Whatever problem they ever encounter they will know the problem will be sorted quickly and that believe is essential for brand building. When addressing users for Basket I noticed it practically. A prompt reply is always appreciated and assures customers that we are serious about them. More people share the bad experience and fewer people share the good experiences with others. So remember to address the bad feedback fast. Bad reviews are gem. They help you to build a great system. Listen to them. Once you get a bad review, thank the customer for the information, examine the problem and resolve it. Most of the time you can turn a negative review into a positive one if you act quickly. Isn’t it feels awesome when people get delighted and tell on their own that they will recommend our product or service to others? Even if you are providing the best product or service, some people will complain. Some will not bother to change the previous bad review even after you addressed the issue. So your goal should be a large number of reviews and if you provide good service more people will rate you good and it will help you to remain at the good position. 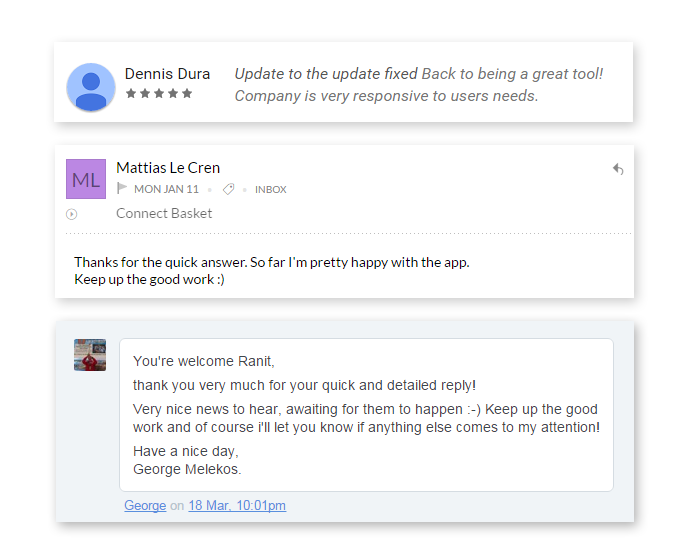 Insert feedback buttons or link of App store in the support e-mails, so that customers can leave a review straight away. When everybody has time constraints, you must make it easy for customers to leave a review. Asking for review with popup and when you want to do a small survey, try to keep them concise so that users can just tap some numbers and can hit ‘send’ button, if a customer wants to leave you some message as feedback they can provide it too, but as much simpler that much better. We all like easy stuff! Right? The art of getting reviews is to asking in proper time and making the process simple. Using good UX you can easily get there but you have to keeping pushing yourself. I would like to hear your experiences, what unique or different things you did to get some awesome user reviews. We all might learn a thing or two from each others experience. We help people with Mobile app UX assessment. Let’s have a 15 minute quick call. schedule the call.